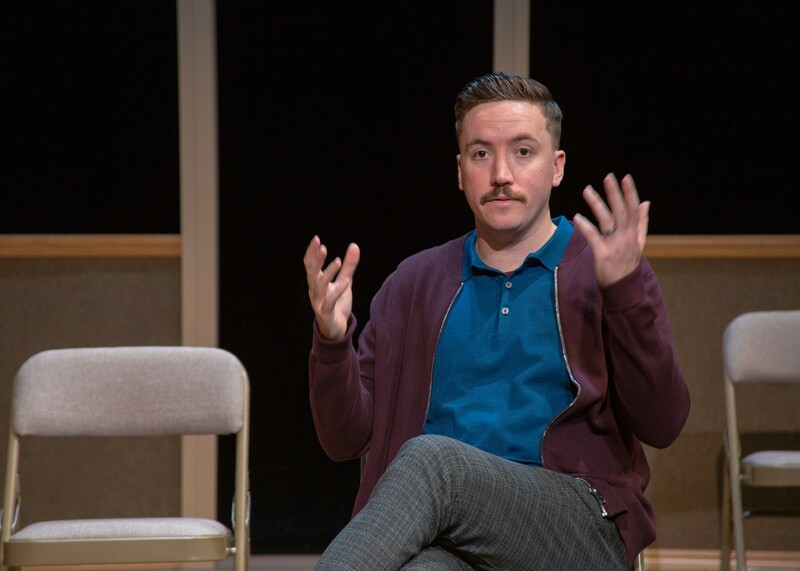 Theater Review: Plan-B Theatre Company's "Good Standing"
Austin Archer in "Good Standing"
Over the course of 75 minutes in Plan-B Theatre Company's world premiere of Matthew Greene's Good Standing, only one actor ever occupies the stage. It's the fact that this one actor takes on so many voices, with such complexity, that makes Good Standing one of the most devastating pieces of original theater to grace an SLC stage in years. Austin Archer is the actor, and he initially appears as Curt Brown, a member of the LDS church who has been called before a disciplinary "Court of Love" for possible punishment—including excommunication—after marrying a man. At first, it seems that this might be a monologue, as Curt faces the 12 men who will judge and/or defend him. Then Archer begins to take on the personas of those men, and multiple voices emerge: an older man with a faintly quavering tone who finds the whole matter disgusting; a father whose own son has disappointed him, though for different reasons; a progressive member who seethes inside at having to defend the Church's policies towards gays and women; Curt's one-time bishop, who relates the complexities of counseling a young gay man. As a piece of performance, Archer's work is astonishing, subtly transforming into these many characters through simple shifts in posture, or the hesitations before trying to say certain uncomfortable words. Jerry Rapier contributes direction that takes the six folding chairs of Keven Myhre's simple set design, and somehow creates the weight of a full jury facing down the solitary Curt. Yet this work is truly elevated by Greene's remarkable text, which manages the tricky balance of respecting the deep conviction of every character's beliefs, while also making it clear the pain these beliefs can cause—not just to others, but to the men themselves. Even more impressively, Good Standing becomes a ferocious challenge to a certain fundamental tenet of most Christian theology. Greene circles back repeatedly to the story of Abraham and his willingness to sacrifice his son Isaac, and the notion of following the understood will of God no matter the possible cost to actual people. Good Standing watches well-intentioned men wrestling with what they believe are their God's moral commandments, and the need to sacrifice personal happiness for heavenly mandates, even as they are able to recognize that people might suffer in this world because of those commandments. A father professes to love his son here, but in this heart-wrenching work, Matthew Greene dares to take on the First Commandment itself: What does it mean to obey God, above all other things, if that obedience hurts those you claim to love? Good Standing runs Oct. 18-28 at the Rose Wagner Center Black Box (138 W. 300 South); limited tickets remain available through ArtTix.